KAZU is proud to provide in-kind on-air support for events happening in our broadcast region. 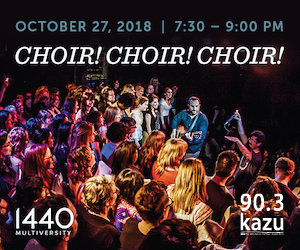 We sponsor a variety of arts, culture and civic events that reflect the mission of KAZU's programming and provide enjoyment, service and outreach to our audience. KAZU’s Media Sponsorship program strives to provide a voice for diverse, thought-provoking ideas, people and experiences within our community. 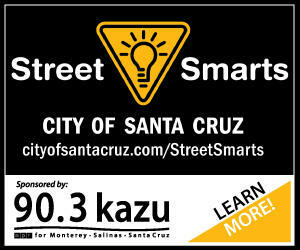 By providing in-kind media sponsorship to local organizations and events, KAZU exposes listeners to a variety of cultural, artistic and community experiences throughout the Monterey Bay Area that entertain, promote discourse and increase participation in our community. Please contact KAZU to request a media sponsorship by calling 831-582-5298 or emailing Mik Benedek at mbenedek@kazu.org. UPCOMING EVENTS LISTED BELOW Click on each event for more info. Truth, democracy and the power of the pen - This year's Founder's Celebration celebrates alumni and faculty who exemplify the best of UC Santa Cruz. Honorees are Secretary of Natural Resources, John Laird, Lisa Getoor, founding director of USCC's Data, Discovery and Decisions Data Science Research Center and Asrophysicist, Natalie Batalha. The program will feature notable national writers Carrie Kahn of NPR and Martha Mendoza of the Associated Press discussing the state of the national free press in the current political environment. 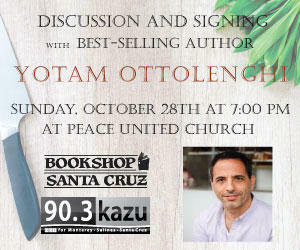 Bookshop Santa Cruz is delighted to welcome best-selling author and James Beard Award-winner, Yotam Ottolenghi, in conversation with chef and writer Samin Nosrat (author of Salt, Fat, Acid, Heat). Israeli-British Chef, restaurant owner and food writer, Ottolenghi has authored six best-selling cookbooks, including "Plenty" and "Plenty More," The event will feature a recipe sampling, courtesy of the Glass Jar restaurant family, with book-signing to follow. Sunday, October 28th at 7:00 PM at Peace United Church. 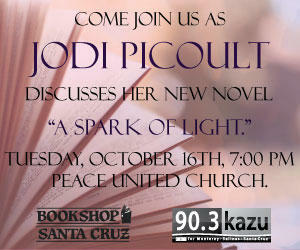 New York TImes Bestselling author, Jodi Picoult, discusses her new, powerful and provocative new novel, "A Spark of Light." Admission includes a pre-signed copy of the book. At Peace United Church, Tuesday, Ocober 16th. 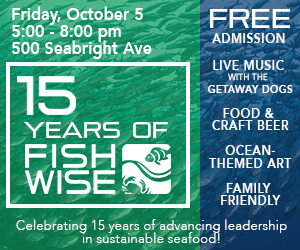 Join FishWise at their headquarters for a free, family-friendly open house. Celebrating 15 years of advancing leadership in sustainable seafood and promoting the health and recovery of ocean ecosystems , the Open House is an opportunity to meet community members, and learn more about fish - from catch to table. 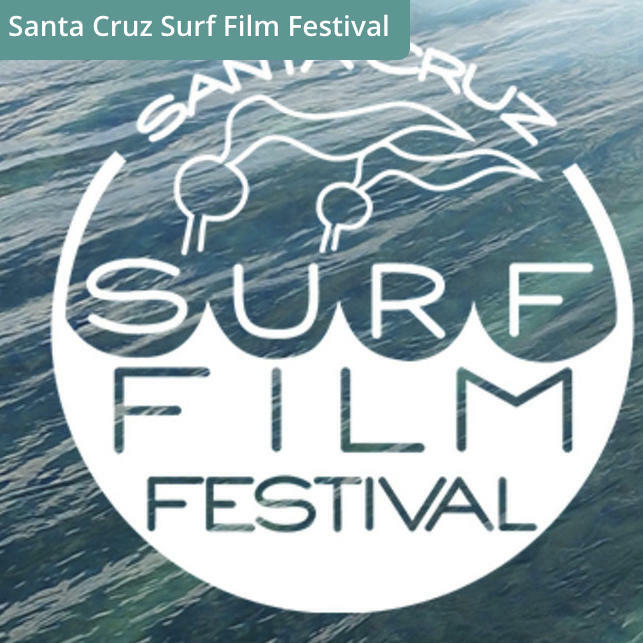 Tasty food, craft beer, live music, ocean-themed art. 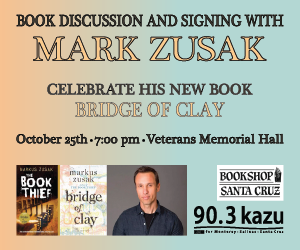 Award-winning and internationally best-selling author of "The Book Thief", Markus Zusak will celebrate the release of his highly anticipated new book, "Bridge of Clay." It's an unforgettable and sweeping family saga, bursting with heart. 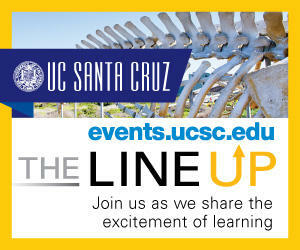 At the Vet's Hall in Santa Clara, 7:00 PM - Thursday, October 25th - Tickets at bookshopsantacruz.com/markus-zusak. 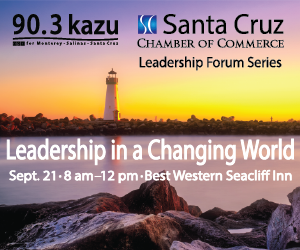 Santa Cruz County Chamber of Commerce's "Leadership Forum"
"Leadership in a Changing World" - is holding our fourth event in a yearlong program. On September 21, at the Best Western Seacliff Inn in Aptos, we have another set of outstanding keynote speakers and panelists who will share their personal stories on how to lead at work, home and in our communities. 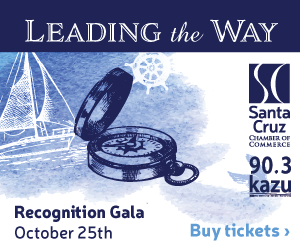 On behalf of the Santa Cruz Area Chamber, please join us for an educational, informative, enjoyable and inspiring opportunity to be with your colleagues, neighbors and chamber friends.